2کارشناس ارشد، گروه روانشناسی عمومی، دانشگاه آزاد اسلامی زرند، کرمان، ایران. 3استادیار، گروه جامعه شناسی، دانشگاه آزاد اسلامی کرمان، کرمان، ایران. مقدمه: امروزه تعداد روزافزونی از افراد دچار اختلال وسواسی- اجباری با رفتارهای تکرار شونده­ای هستند که باعث تداخل در زندگی روزمره آنان است. اهمیت درمان وسواس سبب می­شود درمانگران از مؤثرترین رویکردهای درمانی سود جویند. بنابراین ﻫﺪف از اﻳﻦ ﭘﮋوﻫﺶ، مقایسه تاثیر درمان مواجهه و بازداری از پاسخ و درمان فراشناختی بر نشانگان اختلال وسواسی -اجباری بود. مواد و روش ­ها: اﻳﻦ ﺑﺮرﺳﻲ از ﻧﻮع نیمه­آزﻣﺎﻳﺸﻲ ﺑﻮد. جامعه آماری شامل افراد دارای اختلال وسواسی -اجباری مراجعه­کننده به مراکز مشاوره شهر سیرجان در سال 1396 بودند، تعداد 45 نفر به عنوان نمونه در دسترس انتخاب و در دو گروه آزمایش و یک گروه کنترل (هر گروه 15 نفر) قرار گرفتند. اعضای یک گروه در طول 8 جلسه هفتگی مورد درمان فراشناختی و اعضای گروه دوم مورد درمان مواجهه و بازداری از پاسخ قرار گرفتند. گروه کنترل درمانی بی‌ارتباط دریافت کردند. ابزار مورد استفاده، سیاهه وسواسی- اجباری Madesley بود. برای تجزیه داده‌ها از آمار توصیفی، تحلیل کواریانس و آزمون تی و آزمون تعقیبی توکی استفاده شد. یافته ­ها: درمان مواجهه و بازداری از پاسخ، موجب کاهش معنی­دار در میانگین نمرات وسواس گروه آزمایش نسبت به گروه کنترل گردید (012/0=p). همچنین نمره­های به دست آمده از ارزیابی‌ها در مراحل پیش‌آزمون و پس‌آزمون و تفاوت بین میانگین گروه­ها کاملاً معنی­دار بود (033/0=p). نتیجه­ گیری: بر پایه یافته­های پژوهش، تاثیر درمان مواجهه و بازداری از پاسخ، در کاهش نشانگان اختلال وسواس در مراجعین از درمان فراشناختی مؤثرتر می­باشد. بنابراین درمانگران می‌توانند از این درمان در کنار درمان­های موفق دیگر، جهت ارتقا کیفیت زندگی بیماران استفاده کنند. 2MSc, Dept of General Psychology, Zarand Islamic Azad University, Kerman, Iran. 3Assistant Prof, Dept of Sociology, Islamic Azad University, Kerman branch , Kerman, Iran. Introduction: Today, there are an increasing number of patients suffering from obsessive-compulsive disorder or repetitive behaviors and as a result interfering with their daily life activities. Therefore, treatment of this disorder is of particular importance for therapists working on this field. The purpose of this study was to compare the efficacy OF exposure and response prevention therapy and metacognitive therapy in patients with obsessive-compulsive disorder. Materials and Methods: This is a semi-experimental study with pre- and post-test and a control group. Statistical population included people with obsessive-compulsive referred to counseling centers of Sirjan City. Forty five patients selected as convenience sample were then randomly divided into three groups of 15, two test groups and one control group. The first test group received 8 weekly sessions of meta-cognitive therapy. Exposure and response prevention therapy was assigned for the second test group with similar duration and control group received an irrelevant intervention. The data gathering instrument was the Obsessive-Compulsive checklist of Madesley. Descriptive statistics, covariance analysis and Tukey post hoc test were used to analyze the data. Results: The results indicated that exposure and response prevention therapy had a significant effect on reduction of the mean scores of the obsessive-compulsory disorder compared to the control group (p=0.012). Also, the difference between the scores of pre- and post-test was statistically significant (p=0.033). Conclusion: Based on the findings of this study, the effect of exposure and response prevention therapy on reduction of obsessive-compulsive disorder was higher than that of meta-cognitive therapy and it may be a useful and applicable therapeutic method for relevant therapists working at consultant centers. Seyyed Mohammadi Y. Diagnostic and Statistical Manual of Mental Disorder. (Translation). American Psychiatric Association. 5nd ed. Washington: APA; 2013: 347-8. Fisher PL, Wells A. Metacognitive therapy for obsessive–compulsive disorder: A case series. JBTEP 2008;39(2):117-32. White K, Steketee GS, Julian J. Course and comorbidity in OCD. 1nd ed. Unpublished manuscript; 1992: 331-6. Riggs D, Foa E. Obsessive-compulsive disorder. In D.H. Barlow (Ed. ), Clinical Handbook of psychotherapy. 2nd ed. New York: The Guilford Press; 1993: 189-239. Foa EB, Steketee G, Grayson JB, Turner RM, Latimer PR. Deliberate exposure and blocking of obsessive-compulsive rituals: Immediate and long-term effects. Behavior Therapy 1984;15(5):450-72. Franklin ME, Abramowitz JS, Kozak MJ, Levitt JT, Foa EB. Effectiveness of exposure and ritual prevention for obsessive-compulsive disorder: randomized compared with nonrandomized samples. JCCP 2000;68(4):594-602. Mahdavi H, Faramarzi S. The Effect of Combined Therapy Treatment with Response Inhibition and Parent's Behavioral Training on Obsessive-Compulsive Disorder in Children with Collaboration Disorder, Coping Disorder, and Obsessive-Compulsive Disorder.JFMH 2016;18: 449-54. Arch JJ, Abramowitz JS. Exposure therapy for obsessive–compulsive disorder: An optimizing inhibitory learning approach. JOCRRD 2015;6:174-82. Myers SG, Fisher PL, Wells A. Metacognition and cognition as predictors of obsessive-compulsive symptoms: A prospective study. IJCT 2009;2(2):132-42. Myers SG, Fisher PL, Wells A. An empirical test of the metacognitive model of obsessive-compulsive symptoms: fusion beliefs, beliefs about rituals, and stop signals. JAD 2009;23(4):436-42. Wells A. Metacognitive Therapy for Anxiety and Depression. 1nd ed. New York: Guilford Press; 2009: 215-20.
van der Heiden C, van Rossen K, Dekker A, Damstra M, Deen M. Metacognitive therapy for obsessive–compulsive disorder: A pilot study. JOCRD 2016;9:24-9. Rees CS, van Koesveld KE. An open trial of group metacognitive therapy for obsessive-compulsive disorder. JBTEP 2008;39(4):451-8. Hansmeier J, Exner C, Rief W, Glombiewski J. A test of the metacognitive model of obsessive-compulsive disorder. JOCRD 2016;10:42-8. Simons MA, Schneider SB, Herpertz-Dahlmann B. Metacognitive Therapy versus Exposure and Response Prevention for Pediatric Obsessive-Compulsive Disorder. Psychother Psychosom 2006;75(1):257–264. Solem S, Håland ÅT, Vogel PA, Hansen B, Wells A. Change in metacognitions predicts outcome in obsessive–compulsive disorder patients undergoing treatment with exposure and response prevention. BRT 2009;47(4):301-7. 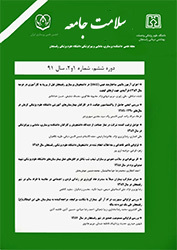 Barahmand U, Tavakolian E, Alaei S. Association of Metacognitive Beliefs, Obsessive Beliefs and Symptom Severity With Quality of Life in Obsessive–Compulsive Patients. APN 2014;28(5):345-51. Hodgson RJ, Rachman S. Obsessional-compulsive complaints. BRT 1977;15(5):389-95. Rachman SJ, Hodgson RJ. Obsessions and compultions. 1nd ed. New Jersey: prentice- Hall; 1980: 120-121. Emmelkamp PM, Beens H. Cognitive therapy with obsessive-compulsive disorder: A comparative evaluation. BRT 1991;29(3):293-300. Wells A. Emotional disorders and metacognition: Innovative cognitive therapy. 1nd ed. New York: John Wiley & Sons ; 2003; 218-225. Leahy RL, Holland SJ, McGinn LK. Treatment plans and interventions for depression and anxiety disorders. 1nd ed. New York: The Guilford Press; 2011: 242-76. Morris RJ, Kratochwill TR. The practice of child therapy. 5nd ed. United States: Taylor & Francis Group; 2012: 183-351.